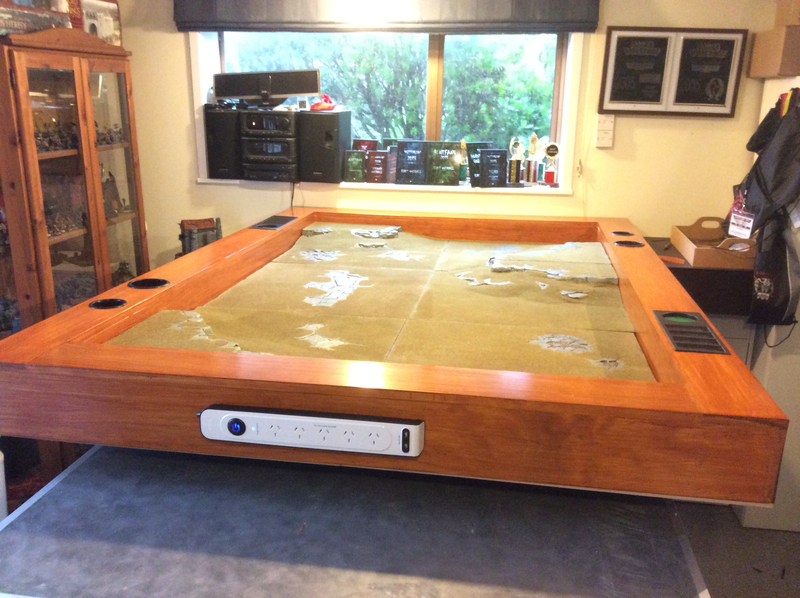 Over the holiday break I have been building a new gaming tabletop for my gaming table in the Dunn-geon. This will be my permanent table and so I wanted something customised and which ticked all the boxes I had. I finished it over the weekend - with Jack's help - and today set it up for a day's gaming tomorrow. Here it is in all its glory. 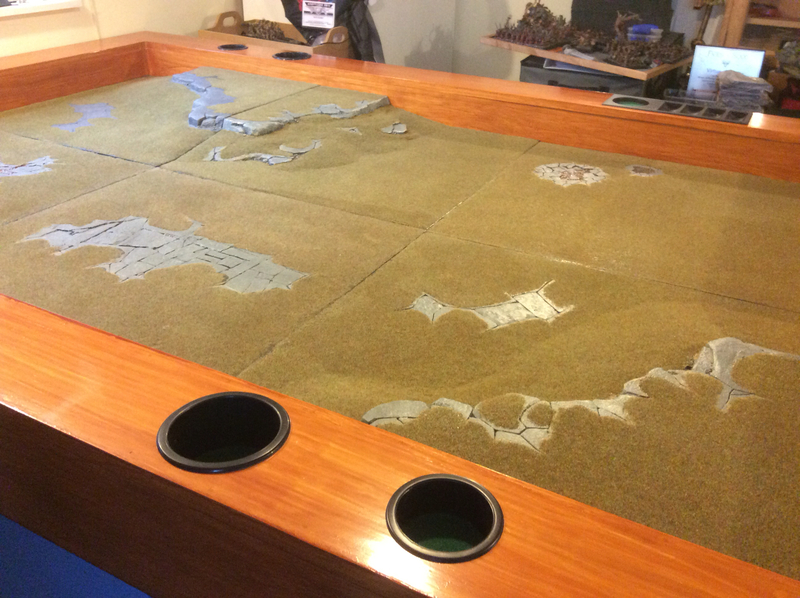 The Realm of Battle game board fits into the playing space. I've made it that the table works for standing rather than sitting as that's how I tend to do most of my gaming. Inset into the sour round are plastic inserts that allow you to organise your counters, markers etc. This one has a shallow cup for tape measure or similar. 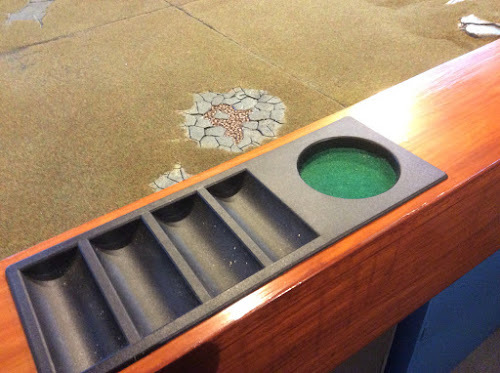 Cup holder inserts for dice and/or drinks. The base of the insert has had felt fixed to the base. On the end I have fitted an electrical box which provides power outlets and USB charger points. All surge protected! 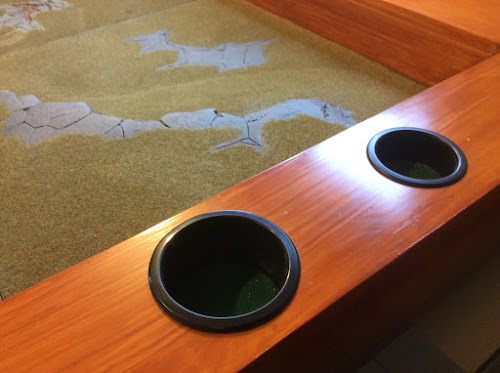 No more dice flying off the table! The ROB is easily removed and replaced with gaming mats for variation. 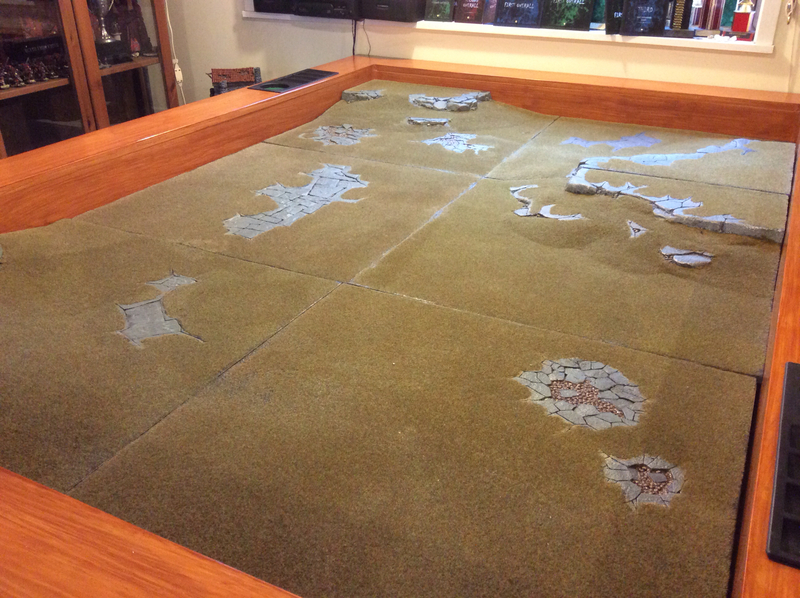 I can also drop in my Tablescapes Urban Street Tiles for some 30k action. I'm really happy with final result and am looking forward to many years gaming on the table. All up I delivered the new top for under $500 (NZD - about USD 333) and probably a total of 12-15 hours of work including planning. Great work Peter. Only a 6x4 though? Looks great! Enjoyed reading how you did it. Looks great. Out of interest, what's the surface like underneath the Realm of Battle boards? Or is it just unfinished wood, given you figure you'll always have something on top? Bottom is 6mm mdf. On top of that I have a sheet of high density foam an 1" thick. Finally I have a piece of 18mm chipboard but with formica on both sides (I bought a whole lot of sheets from a kitchen producer that I use for tabletops. I may make a wooden cover for it at some stage. Just played two games on it and the extra height is great for back. Excellent craftmanship, it's beautifully done. The thought you've put into the design is also plain to see. Great work. How are you getting power to your strip? I don't see any wires anywhere. 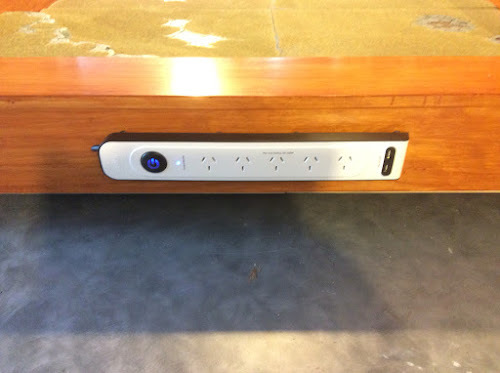 Love the idea of power and USB ports for all my devices! Drilled a small hole through side panel right by power box. Removed plug on lead and threaded it through. At far end is a small hole in base that has had lead threaded through back out and plug put back on - to be plugged into wallsocket. Very good blog post. I absolutely love this website. Keep writing, dig this!